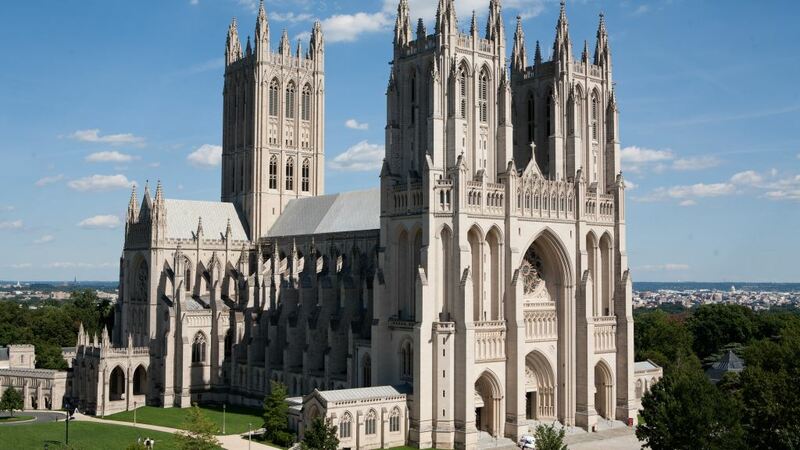 Comparative Religion Students and their families are invited to experience a Holy Eucharist at the Washington National Cathedral. This event is one of the many trips and tours being scheduled as part of this year's curriculum. Families and siblings are welcome to attend this Holiday service. The largest of the Sunday services, the Holy Eucharist is a formal liturgy which includes many elements of the Cathedral worship tradition. It features the Cathedral Choirs, congregational hymns, readings from Scripture, Holy Communion, and a sermon. As part of the Episcopal Church, worship at the Cathedral follows the form of the Book of Common Prayer. The service lasts approximately 75 minutes. Over 270,000 people visit the structure annually. The cathedral's structure is of Neo-Gothic design. It is the 2nd largest church in the United States and 4th tallest structure in DC. On January 6, 1893, the Protestant Episcopal Cathedral Foundation of the District of Columbia was granted a charter from Congress to establish the cathedral. Construction started September 29, 1907, with a ceremonial address by President Theodore Roosevelt and the laying of the cornerstone. The Cathedral's final design shows a mix of influences from the various Gothic architectural styles of the Middle Ages identifiable in its pointed arches,flying buttresses, a variety of ceiling vaulting, stained-glass windows and carved decorations in stone, and by its three similar towers. Be sure to register for this event because seats are limited!